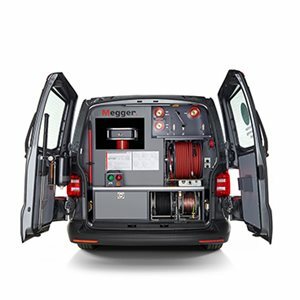 The system structure of the City Series offers new and unique capabilities of cable fault location, VLF testing and partial discharge diagnostics. Due to the size of the component parts, an entire single-phased test system for cables rated up to 33 kV fits into the smallest vehicles. Parking bay and ceiling height problems in underground parking and train stations, and working in narrow alleys, these are a thing of the past with this test van. With the fully integrated measurement technology in the vehicle, the safety area around the test object can be as small as possible. Furthermore, the integrated PD-coupler allows a solution independent of weather conditions. Difficult locations for partial discharge diagnosis, like tower or compact substations, no longer pose a problem.